The reason behind sweeping victory of Modi is voters’ belief in him to replicate his success in Gujarat on a national level and change the way the country has been governed, especially in the last 10 years. In its first few weeks, the Modi government has set the tone. Now the common persons as well as business leaders are closely watching exactly how far and how fast can Modi change India? 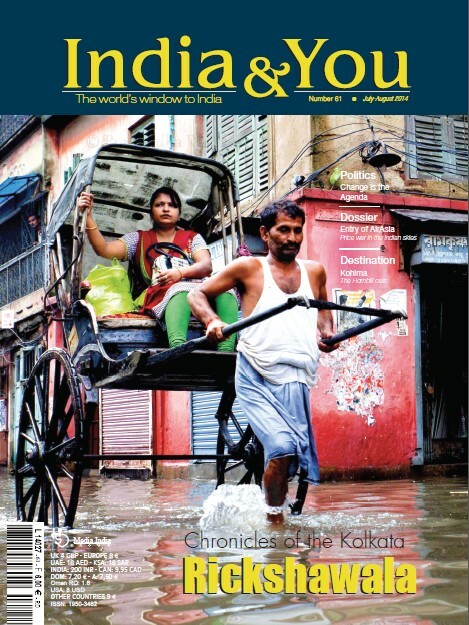 If a desire for change were the main reason behind the surprisingly massive mandate for Narendra Modiled Bharatiya Janata Party in the general elections, then the voters would definitely have no reason to be less than very happy with the first few weeks of the government headed by Prime Minister Modi. For a first timer as Prime Minister, Modi displayed surprising astute – political as well as diplomatic – by inviting to his swearing-in ceremony the heads of the seven South Asian nations and Mauritius – a country which has very special ties with India. The invitation, which caught every invitee as well as Modi’s supporters and opponents alike, was a coup d’etat and one of the best ways that he could set at rest any anxieties that India’s neighbours may have harboured about his approach towards these nations. The gesture was simple, but clearly the impact was huge – both in the media and also vis-a-vis the leaders of India’s neighbours. 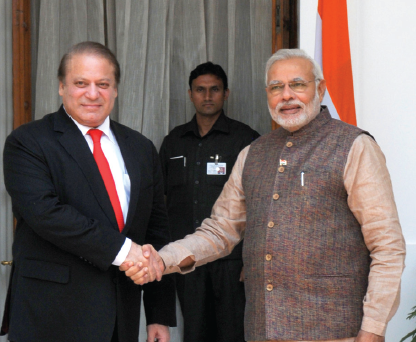 Modi also used the occasion to break the ice with his counterparts, especially Pakistan Prime Minister Nawaz Sharif and Sri Lankan President Mahinda Rajapakse, two countries with whom relations have been rather strained over the last few months. While the new government displayed an unprecedented flexibility and openness vis-a-vis its smaller neighbours, it also conveyed some hard messages to bigger nations like China, the United States and Russia. During a visit by the Chinese foreign minister to New Delhi in June, his Indian counterpart, Sushma Swaraj, told Wang Yi that while India respects a One China policy, it also expects China to have a One India policy. This was in the context of Yi’s statements about why China would continue to not issue visas to Indians from states like Jammu & Kashmir in the north and Arunachal Pradesh in the east, territories that are contested by China. Modi also chose the tiny Himalayan Kingdom of Bhutan as the first country to visit after taking charge of the government. 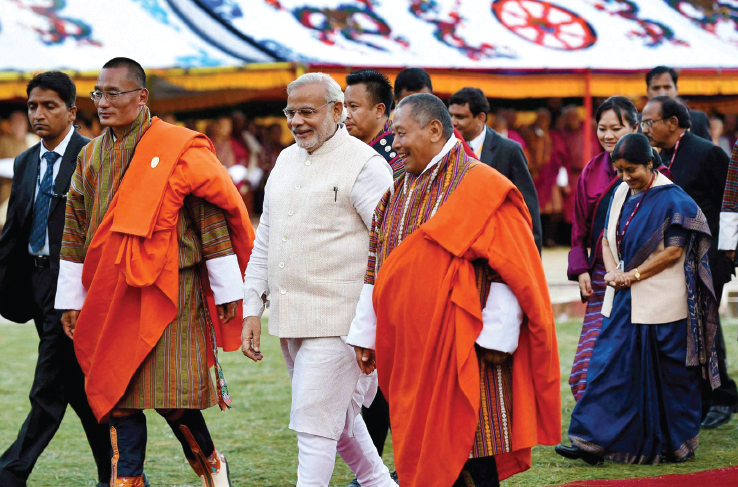 Though small, Bhutan is a crucial geostrategic partner for India. The two countries have enjoyed a very special relationship for over 65 years. However, the last few years have seen China trying to make forays in the country, funding various projects. The Chinese strategy is similar to the approach it has adopted vis-a-vis other neighbours of India – notably Sri Lanka, Nepal, Bangladesh and Myanmar. While Modi has gotten off on a good start in the international circuit, his bigger and more crucial test lies in how he addresses the domestic issues like corruption, inflation, cutting through red tape, kick starting economy, boosting business confidence and promoting inclusive growth. The Indian stock markets have been rising since the beginning of the year, in anticipation of a business-friendly, Modiled government and have of late reached record levels. However, now Modi needs to tackle the real, hard issues. Controlling inflation, especially food inflation, is one. Though overall inflation had been declining since the beginning of the year, it rose again recently, largely on fears of an unfavourable monsoon, which is critical for agricultural production and hence impacts food inflation. Another challenge for Modi is to take the economic growth back to the previous levels of over seven per cent. This may prove to be tough especially if inflation rises again. This would need a string of economic reforms and not all of them would prove to be easy, even for a government that does not depend upon coalition partners for survival. In a speech in June, Modi began preparing Indians for some tough reforms that would be necessary to bring the economy back on track. He said, “Tough economic decisions will be required to bring the country out of the current economic mess.” He expressed confidence that the “stringent measures” for prudent financial discipline will not be for his own or his party’s interest, but “the larger interest of the nation”. “I am well aware that my steps may dent the immense love that the country has given me. But when my countrymen realise that these steps will result in getting the financial health back, then I will regain that love,” he said. His test is not too far as the new government would present its first budget in the Parliament in mid-July and this budget would set the tone for the governance that businesses in India can expect from the new government for the next five years. Besides boosting growth, Modi also needs to restore business confidence, which has jumped up since his victory on May 16. But to sustain it high, Modi would need to deliver and that too rapidly. 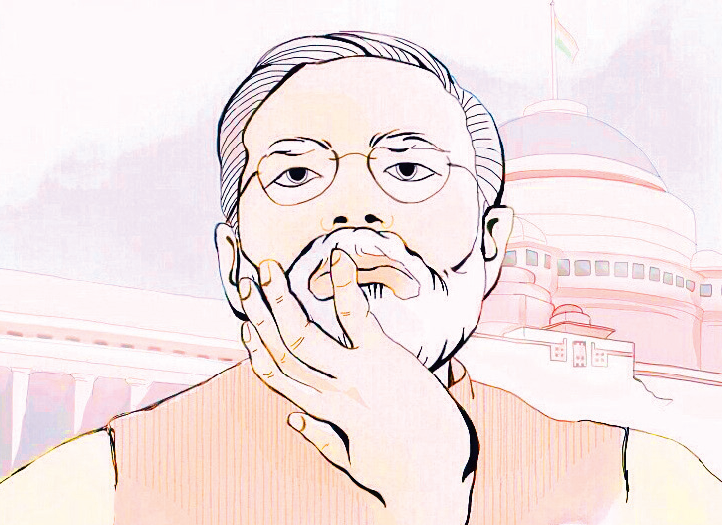 Tackling corruption is perhaps going to be the toughest test for Modi. Though it has existed since the time of the British Raj, corruption under the previous government grew to record levels and was one of the principal reasons behind the defeat of the Congress-led coalition. While Modi himself enjoys a clean image, the same cannot be said of other BJP leaders and certainly not of some of his ministers. And while Modi could theoretically curb the appetite of his party and government colleagues, it would require a magic wand for him to make corruption disappear from all aspects of the Indian society and especially those which tough and hurt the common persons the most. Modi’s entire campaign was based on change and how he would be different and more efficient that the Congress-led government. This has raised expectations to such high levels that the new government would be hard pressed to be able to meet them. “Partially due to the inactivity of the previous government and partially due to the number of promises made by Modi and the image cultivated by him as an efficient administrator, now people would expect miracles from him. Right from resolving the steep electricity deficit in the country to creating millions of new jobs and building the infrastructure in the country,” says an analyst based in Mumbai. The other set of expectations relate the extreme right wing elements of his own party who have reveled in the victory, believing that now they would get a free hand in carrying out their anti-minorities agenda. However, the issue is so volatile that even a comfortable majority in the Parliament would not be enough to protect the Modi government from the virulent reaction that it would evoke.